A Virginia firefighter was killed when a tractor-trailer slammed into his fire truck while he was responding to a two-car crash in heavy storm conditions. Virginia authorities have confirmed five storm-related deaths in the state. Department of Emergency Management spokesman Jeff Caldwell told The Associated Press on Friday that four people drowned: three in the western part of the state and a fourth in central Virginia. 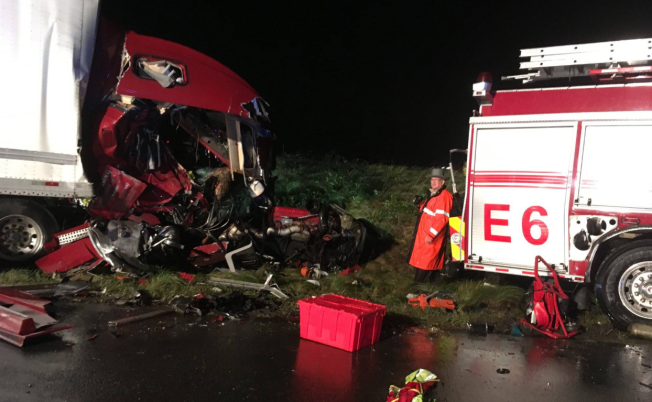 A firefighter in Hanover, Virginia, was killed when a tractor-trailer slammed into his fire truck while he was responding to a two-car crash in heavy storm conditions. The Hanover County Fire-EMS Department says the fire engine had its lights and other emergency equipment activated, but roads were slick and the storm conditions were heavy. Among the drowning victims was 45-year-old James E. King Jr. of Dry Fork, Va. The Pittsylvania County Sheriff's Office says King was caught in his vehicle in a flash flood Thursday around 3:30 p.m.
A Pittsylvania County Sheriff's deputy and a local resident tried to rescue King, but the floodwaters were too deep and fast-moving. Volunteer firefighters and the State Police later found his body downstream Thursday night. Caldwell says there were five suspected tornadoes in the state, but they are still awaiting National Weather Service confirmation. Hurricane Michael slammed into the Florida Panhandle Wednesday afternoon, splintering homes and submerging neighborhoods before weakening to a tropical storm overnight. The storm moved through the Carolinas and southern and central Virginia Thursday, bringing flooding to parts of the state. Virginia's governor declared a state of emergency earlier Thursday in anticipation of effects from the tropical storm. More than 440,000 people across the state were without power Friday morning.